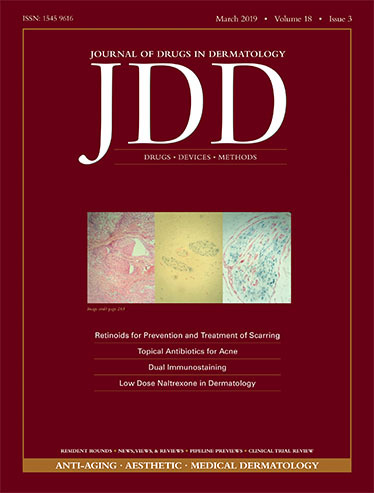 Below are the issue highlights and Editor Picks for the March issue of JDD! Recent evidence highlights the importance of early and effective treatment in treatment and prevention of acne scars in The Role of Topical Retinoids in Prevention and Treatment of Atrophic Acne Scarring: Understanding the Importance of Early Effective Treatment. Efficacy of a Once-Daily Fixed Combination Halobetasol (0.01%) and Tazarotene (0.045%) Lotion in the Treatment of Localized Moderate-to-Severe Plaque Psoriasis presents new data topical treatment of psoriasis. Authors release Clinical Evidence of Dermal and Epidermal Restructuring from a Biologically Active Growth Factor Serum for Skin Rejuvenation. Simple and reproducible method is presented in Combination of Fractional Resurfacing and Dermabrasion Techniques to Improve Aesthetic Outcomes of Facial Grafts. Assessing the Synergistic Effect of a Fixed Combination Halobetasol Propionate 0.01% and Tazarotene 0.045% Lotion in Moderate-to-Severe Plaque Psoriasis looks at synergy of a fixed combination topical therapy for psoriasis. New formulations of topical minocycline currently offer lower rates of antibiotic resistance, an excellent safety profile, and reduced acne lesion counts, without the side effects in Treating Acne With Topical Antibiotics: Current Obstacles and the Introduction of Topical Minocycline as a New Treatment Option . Brodalumab may continue to have the most rapid onset in Onset of Action of Antipsoriatic Drugs for Moderate-to-Severe Plaque Psoriasis: An Update. The Use of Deoxycholic Acid for the Clinical Reduction of Excess Submental Fat shows excellent results for submental fat reduction. Authors examine the existing evidence for use of LDN in Review of Low Dose Naltrexone in Dermatology. Neural and cytokeratin markers can be combined to improve confidence in the diagnosis in Dual Immunostaining With SOX10 and AE1/AE3 to Confirm Perineural Invasion on Mohs Sections.